The ocean supports many ecosystems which contain a diversity of living things ranging in size from tiny microbes to whales as long as 95 feet. Despite the fact that I am working on a hydrographic ship, when out on a skiff or while in port, I have had the opportunity to view some of these ecosystems and a number of the species found in them. 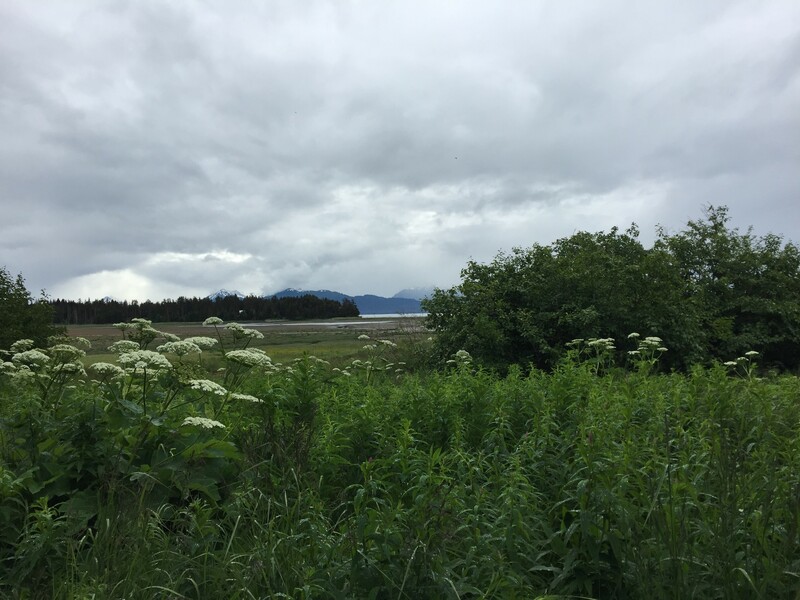 While the Rainier was in port in Homer, I spent some time at the Kachemak Bay National Estuarine Research Reserve which, like other estuaries, is among the most productive ecosystems in the world. An estuary, with accompanying wetlands, is where the freshwater from a river meets and mixes with the salt water of the sea. However, there are some estuaries that are made entirely from freshwater. These estuaries are special places along the Great Lakes where freshwater from a river, with very different chemical and physical characteristics compared to the water from the lake, mixes with the lake water. Because estuaries, like the Kachemak Bay Estuary, are extremely fragile ecosystems with so many plants and animals that rely on them, in 1972 Congress created the National Estuarine Research Reserve System which protects more than one million estuarine acres. Prior to my experience in Alaska, I had never realized what a vital role tides play in the life of living things, in a oceanic region. 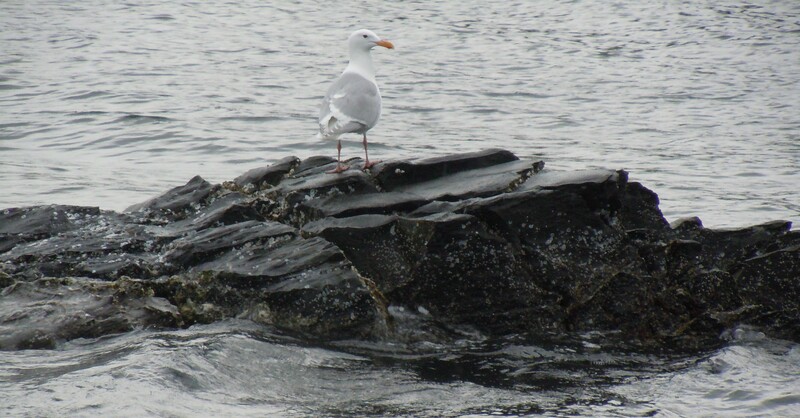 Just as tides play an important role in the health and function of estuaries, they play a major role in the plants and animals I have seen and the hydrographic work being completed by the Rainier. For example, the tides determine when and where the skiffs and multi beam launch boats will be deployed. Between mean low tide and high tide the water depth can vary by as much as 12 feet and therefore low tide is the perfect time to send the skiffs out in to document the features (rocks, reefs, foul areas) of a specific area. Rock feature in Uganik Bay (actually “the foot” mentioned in previous blog) Notice tidal line, anything below the top of that line would be underwater at high tide! Tufted Puffins: Tufted Puffins are some of the most common sea birds in Alaska. They have wings that propel them under water and a large bill which sheds its outer layer in late summer. Double Crested Cormorants: Dark colored birds that dive for and eat fish, crabs, shrimp, aquatic plants, and other marine life. The birds nest in colonies and can be found in many inland areas in the United States. The cormorants range extends throughout the Great Lakes and they are frequently considered to be a nuisance because they gorge themselves on fish, possibly decimating local fish populations. 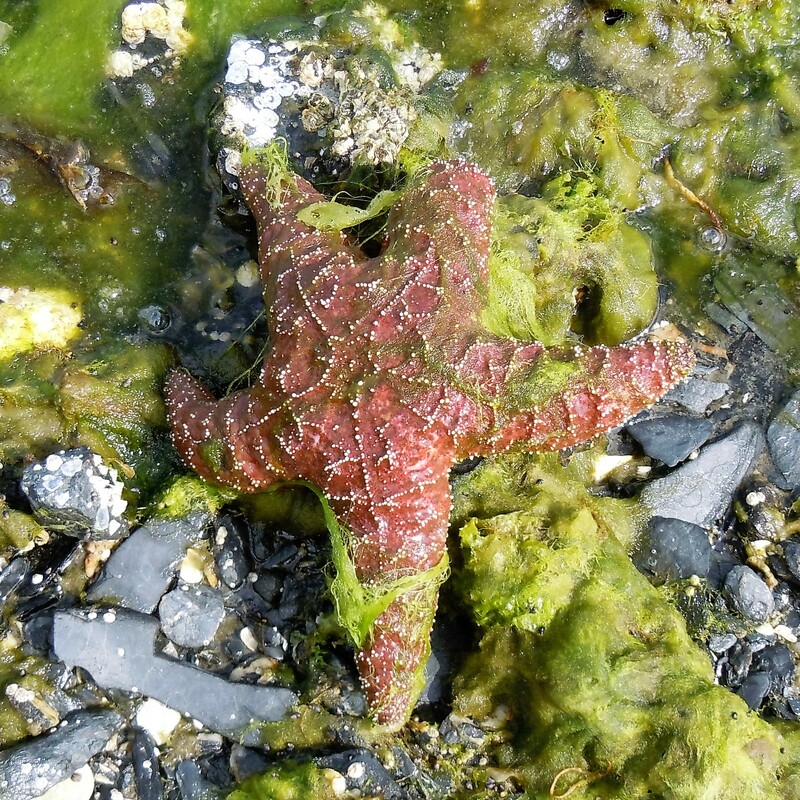 Pisaster Starfish: The tidal areas are some of the favorite areas starfish like to inhabit because they have an abundance of clams, which the starfish love to feed on. To do so, the starfish uses powerful little suction cups to pull open the clam’s shell. 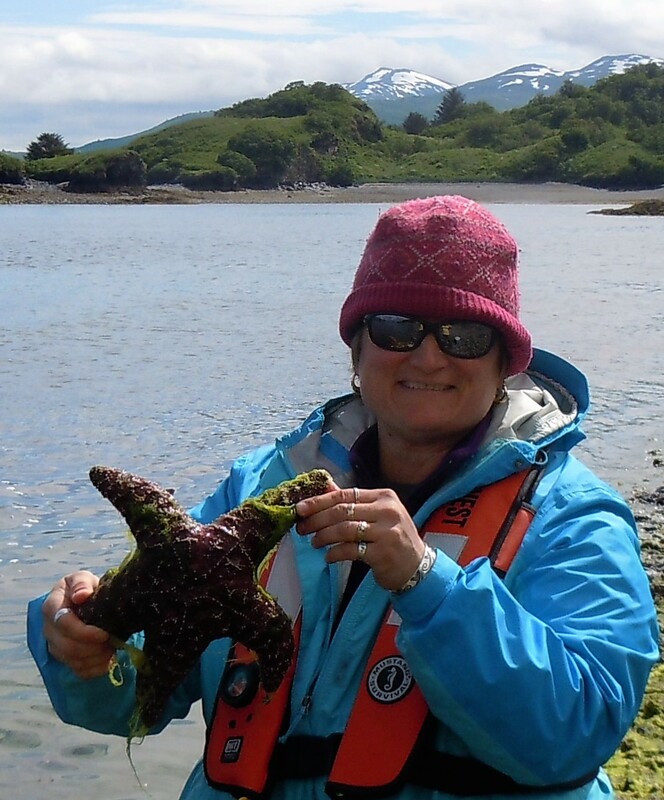 Teacher at Sea Kurth with a starfish that was found during a shore lunch break while working on a skiff. Glaucous-winged Gull: The gulls are found along the coasts of Alaska and Washington State. The average lifespan of Glaucous-winged Gull is approximately 15 years. 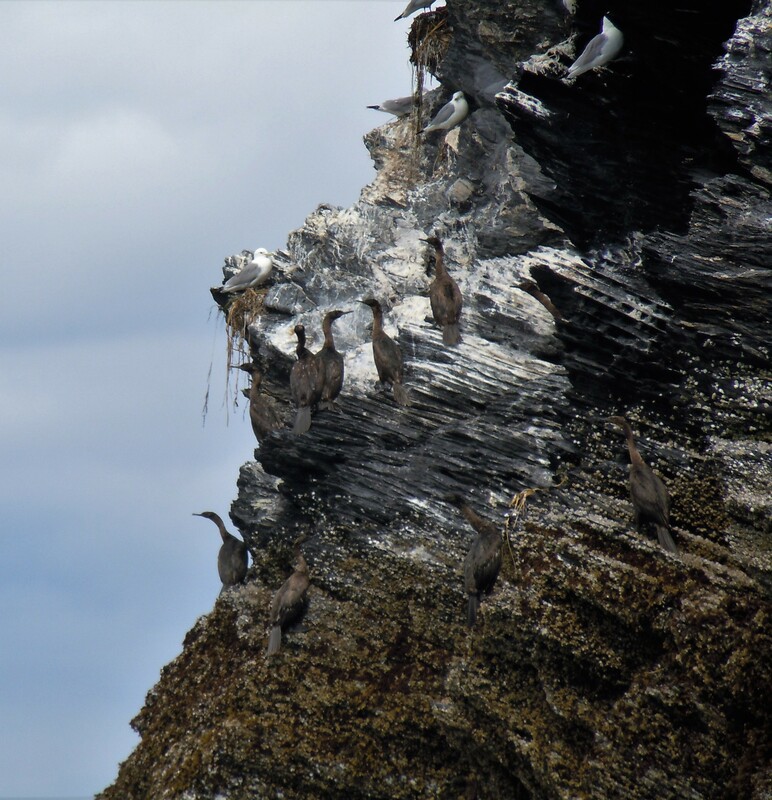 The hydrographic work in Uganik Bay continues even though there are moments to view the wildlife in the area. I was part of the crew on board a boat equipped with multi beam sonar which returned to scan the “foot feature” meticulously mapped by the skiff. During this process, the multi beam sonar is driven back and forth around the feature as close as the boat can safely get. The multi beam does extend out to the sides of the boat which enables the sonar to produce an image to the left and right of the boat. The sonar beam can reach out four times the depth of the water that the boat is working in. For example, if we are working in six feet of water the multi beam will reach out a total of 24 feet across. Think of the sonar as if it was a beam coming from a flashlight, if you shine the light on the floor and hold the flashlight close to the floor, the beam will be small and intense. On the other hand, if you hold the flashlight further from the floor the beam of light will cover a wider area but will not be as intense. The sonar’s coverage is similar, part of why working close to the shore is long and tedious work: in shallow water the multi beam does not cover a very wide area. Image of “the foot” after processing in lab. 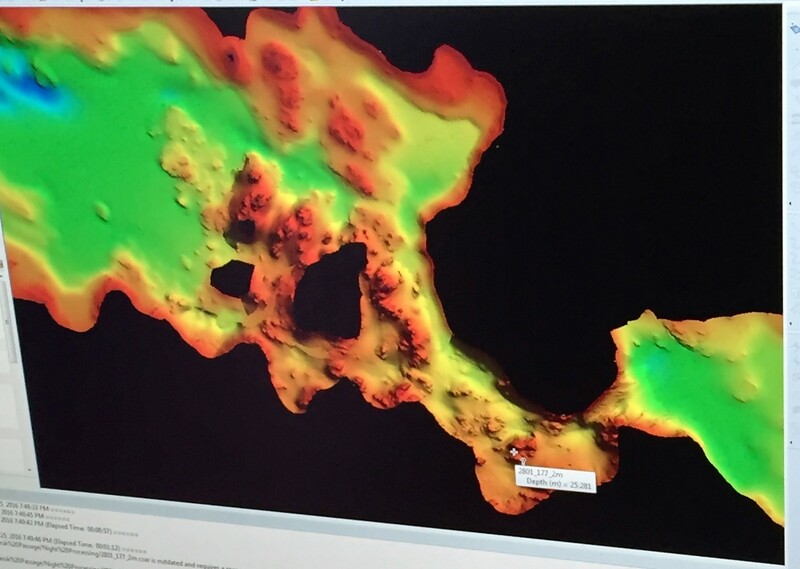 The rocks are the black areas that were not scanned by the multi beam sonar. I met Angelica on one of the first days aboard the Rainier and later spent some time with her, asking questions as she worked . Angelica is very friendly, cheerful and a pleasure to talk with! She graciously sat down with me for an interview when we were off shore of Kodiak, AK before returning to Uganik Bay. I’m Angelica Patyten originally from Sacramento, CA and happy to be a part of NOAA’s scientific mission! I have always been very interested in marine science, especially marine biology, oceanography and somewhat interested in fisheries. Ever since I was a little kid I’ve always been interested in whales and dolphins. My cousin said that when I was really young I was always drawing whales on paper and I’d always be going to the library to check out books on marine life. I remember one of the defining moments was when I was in grade school, we took a trip to see the dolphins and orca whales and I thought they were amazing creatures. As far as hobbies, I love anything that has to do with water sports, like diving and kayaking. I also want to learn how to surf or try paddle boarding as well. I just kind of “stumbled upon” NOAA right after I had graduated from college and knew that I wanted to work in marine science. I was googling different agencies and saw that NOAA allows you to volunteer on some of their vessels. So, I ended up volunteering for two weeks aboard the NOAA ship Rueben Lasker and absolutely loved it. When I returned home, I applied online for employment with NOAA and it was about six months before I heard from back from them. It was at that point that they asked me if I wanted to work for them on one of their research vessels. It really was all good timing! 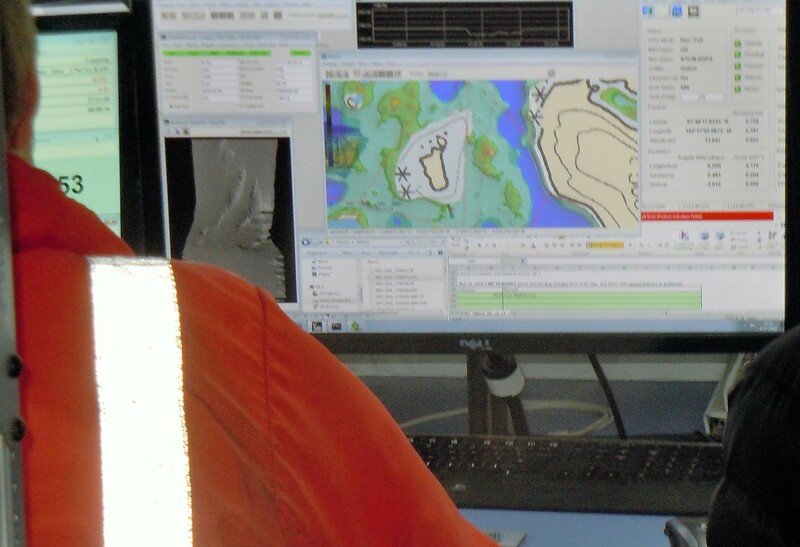 What are your primary responsibilities when working on the ship? My responsibilities right now include the processing of the data that comes in from the multi beam sonar. I basically take the data and use a computer program to apply different settings to produce the best image that I can with the sonar data that I’m given. What do you love about your work with NOAA? I love the scenery here in Alaska and the people I work with are awesome! We become like a family because we spend a lot of time together. Honestly, working aboard the Rainier is a perfect fit for me because I love to travel, the scenery is amazing and the people I work with are great! Geoffrey Chaucer wrote, “time and tide wait for no man.” Chaucer’s words are so fitting for my time aboard the Rainier which is going so quickly and continues to revolve around the tides. 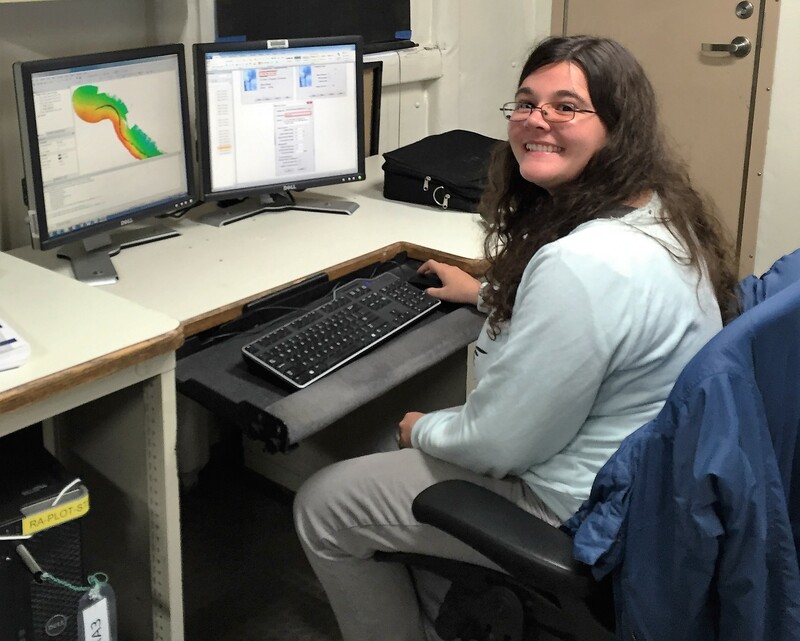 This entry was posted in 2016, Lynn Kurth 2016, NOAA, NOAA Teacher at Sea and tagged estuary, Kodiak Island, Lynn Kurth, multibeam sonar, NOAA, noaa ship rainier, tide, Uganik Bay. Bookmark the permalink.